Christmas Classics Ltd. was founded in 1999 to publish and create unique and exquisite Christmas music packages that heretofore have not been offered to customers who treasure Christmas music. 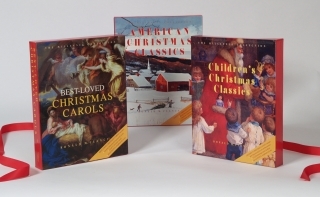 Titled THE MILLENNIA COLLECTION: Glorious Christmas Music, Songs and Carols, this significantly new family of imaginary Christmas music packages fuses beautiful music CDs with lavishly illustrated coffee table styled books about the fascinating stories and history of Christmas music, songs, and carols, in addition to the song lyrics. The fine art and illustrations come from the great museums and libraries of the Western World.